While we’re still on our virtual visit to Sweden for yesterday’s post about Anders Zorn, we should stop by and say hi to John Bauer, a dramatically underappreciated fantasy artist. Looking at Bauer’s wonderfully caricaturish trolls and gnomes, his glowing young princesses and his dark forests of ancient trees, their roots intertwined in Art Nouveau grace, it’s easy to jump to the conclusion that Bauer adopted many of the stylistic elements associated with the great illustrators that embody that approach, like Arthur Rackam, Kay Neilsen and Edmund Dulac. In fact, the influence probably runs in the opposite direction, or at the very least in both directions. Bauer slightly predates Rackham, Neilsen and Dulac and, while he was undoubtedly influenced by them, his style and subject matter also likely informed much their work and, through them, influenced subsequent generations of fantasy artists. Bauer himself was likely exposed to the work of Anders Zorn, who was popular in Sweden at the time, but was probably also influenced by Symbolist painters like Arnold Böcklin, visionaries like Gustav Moreau and William Blake and the stylized work of the Pre-Raphaelite and Art Nouveau artists, and perhaps the graceful illustration style of Walter Crane. 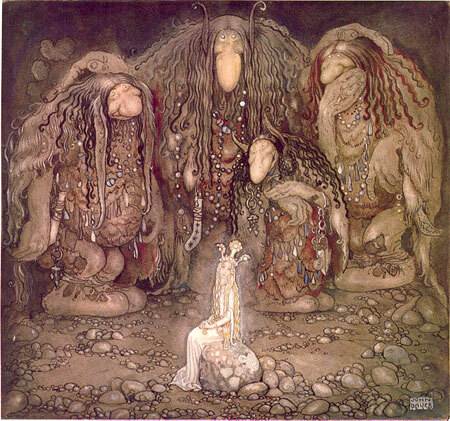 Bauer achieved prominence in Sweden with his illustrations for Bland Tomtar och Troll (Among Elves and Trolls), a yearly published book of fairy tales, and illustrated other books and periodicals. His wonderfully stylized drawing style, fascinating experiments with composition and his uncanny ability to make his fairy tale subjects simultaneously dark and elegantly charming have made him a favorite among those familiar with his work. There is a John Bauer Museum site, which I think refers to a physical museum as well as the online one, but I’m unsure. It’s unfortunate that books of fairy tales for which he did his illustrations were not widely translated into English. Had they been, Bauer would be as familiar as Rackham. Yes, John Bauer’s work really deserves to reach a wider audience outside of Sweden. One of the reasons for his relative obscurity though is that he died only 35 years old, together with his family, when the ferry they travelled on sank. There appears to be a collection of Swedish Folk Tales that features many of his illustrations available on Amazon. Another Swedish artist you really should check out is Carl Larsson. His work is especially interesting in that it mixes ink and water colour in a very attractive way, that has been influential on many later illustrators. You can find his paintings here and here. This is my new favorite painting ever! The imagery speaks so much to a childish fantasy on a very adult level. His work looks so modern to me! Thanks for writing about him, I don’t think I had ever seen this artist’s work. You have a wonderful blog. It’s great that you can convey your appreciation for art in such a concise, not pretentious way. Thanks, all, for your comments. I’m glad to hear the English language link is working on the site now. It’s unfortunate there isn’t more information about Bauer in English and other languages, his work deserves wider appreciation. John Bauer really captured enchanting feelings in his beautiful and brilliant illustrations. Nice to see him being promoted for the audiences! I’ll have to search for his books when visiting Sweden next time. As an anecdote, his “Tuvstarr” picture has been used in music album covers, f.ex. in BIS 1996 release of Jean Sibelius “The Wood-Nymph” recording, and in the rock album “Second Sight” by Danish Culpeper’s Orchard from year 1972.
i love the beauty of this picture. the innocence is captured by the princess, but the trolls also have a sense of benevolent and gentle curiosity. this is lovely. I will definately tell more people about this artist. he has done loads and loads of pictures, all very precious and unique. not as high-artsy perhaps but lots of imagination and talent. my first thought was that this painting was by brian froud! i guess it would not surprising that he (froud) was influenced by bauer as well. Does anyone know where I can get a John Bauer type of troll figure, either made of ceramic or plastic. Would be good if it had cloth type clothes also.